Tomorrow millions of people around the globe will experience a total solar eclipse. 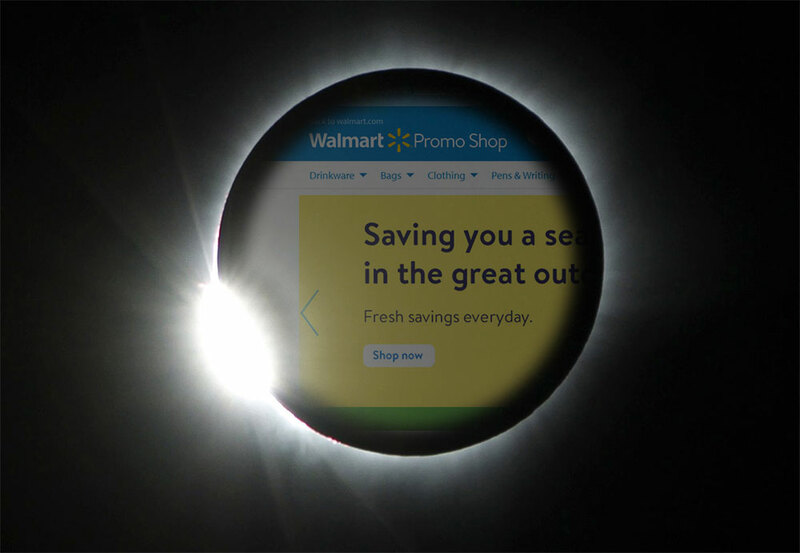 For many, it will be their very first eclipse. As I sit here in an aluminum tube hurtling through the air at 478mph, 40,000 feet above the earth, I find myself looking at the sun’s reflection on the wing, pondering the sheer wonder and awe that will go through the minds of those who are lucky enough to experience tomorrow’s “totality”. At the same time there are also those who are preparing for the end of the world as we know it. That’s right, there are people around the earth who believe that the eclipse is the opening act of the apocalypse. In fact, one prophecy website that boasts thousands of followers claims that tomorrow’s eclipse will kick off a seven-year period during which 75% of the world’s population will be destroyed. I read those articles and the requisite barrage of comments with the same combination of incredulity, frustration, and, well, amusement, that I experience when I read the comments following the latest headline in our industry to take social media by storm. You know which one I’m talking about, don’t you? Not since Vistaprint and Amazon launched their promo businesses has there been such an immediate and audible gasp by members of our industry. Last week at the North American Leadership Conference and Tech Summit the buzzword of the week was “Amazon-like experience”. Do we need to be worried that one year from now we’re going to be talking about a “Walmart-like experience”? First, to put your mind at east just a bit; Walmart themselves did not “enter” the promotional products industry. At least not directly. If you dig a bit deeper you’ll see that the site looks strikingly similar to another site that is run by a promotional products distributor. Coincidence? No. The Walmart Promo Shop site is simply a branded site that a savvy distributor pitched to Walmart, likely in return for a portion of the profits, a licensing fee, or some combination thereof. This differs strikingly from what Amazon and Vistaprint are doing, where our distributor channel isn’t involved at all. Yes, Walmart does nearly half a trillion dollars in business each year. Yes, they have roughly 4000 retail outlets across the country. Yes, they employ over two million people. But how many of those employees do you think know the first thing about the promotional products business? Secondly, for the most part nothing has changed. If you are a distributor you will continue to compete against people who focus solely on price as their main competitive advantage. 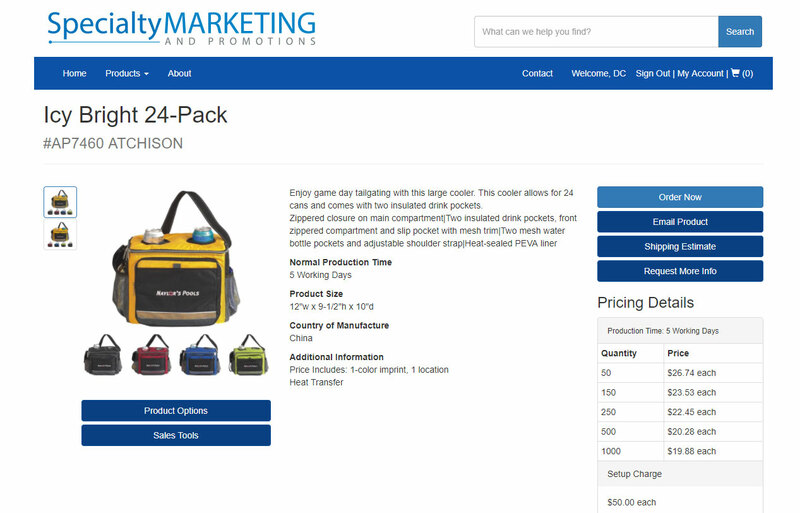 In the particular case of the Walmart Promo Shop site, that is even less worrisome since, as a few savvy commenters pointed out in the Promotional Products Professional group on Facebook, this site isn’t listing products at prices lower than what most of you are currently able to offer. In fact, if your concern relates primarily to price let’s look at a specific example. 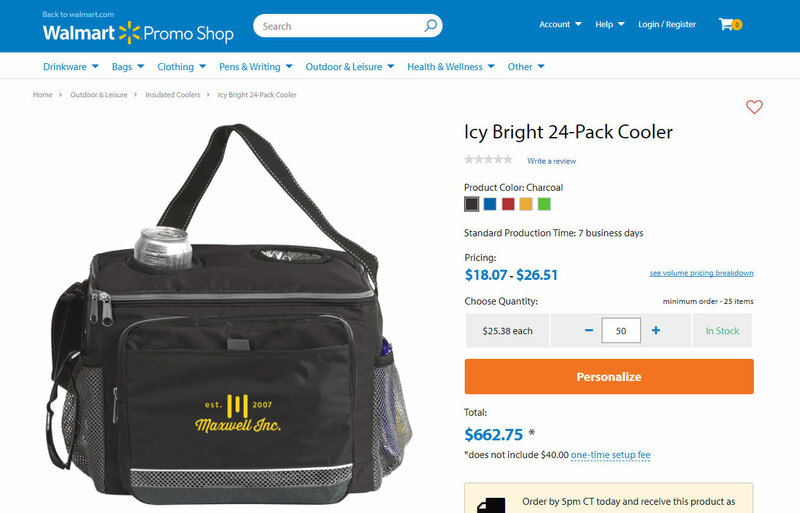 If you look at the Icy-Bright 24-Pack Cooler on the Walmart Promo Shop site and the same product on a distributor site hosted by DistributorCentral that’s using standard, published supplier retail pricing you’ll see that the difference in price just over one dollar, or roughly four percent. That is to say, your customer could buy this cooler for one dollar less on the Walmart Promo Shop site than they could if they bought it from you at standard listed prices from the supplier. I’m guessing that many of you have negotiated some level of preferred pricing from suppliers so any worry about being beat on price by the Walmart Promo Shop site goes out the window when you break down the numbers. But let’s assume for a minute that you don’t get any special pricing from suppliers and you sell to your customers at full advertised retail price. Can you provide your clients with one dollar of value? Just one dollar, on a $26 item? The difference in what Amazon, Vistaprint, and Walmart provide to their customers and what you provide to your clients is, well, you. Your imagination, your creativity, your consultative approach to developing marketing solutions, and your willingness to work hand in hand with your clients to help them achieve their goals. That imagination, creativity, and relationship-focused approach provides your clients with so much more than one dollar. One of the comments that stuck with me during last week’s North American Leadership Conference was a comment made by Roy Spence, the creative mind behind some of the most successful marketing campaigns in history. No offense to Walmart, but they aren’t in the business of selling purpose-inspired solutions. At least not when it comes to promotional products. Distributors in our industry should, however, be in the mindset of selling purpose-inspired solutions to their clients and it’s those solutions that add the value that makes the distributor channel in this industry so important. That said, we cannot ignore the fact that companies like Amazon, Vistaprint, 4imprint and others are providing a fast, easy, frictionless method of ordering promotional products. Embracing that type of technology and having it available in your toolset is critical as you strive to build relationships, engage more efficiently with your customers and do business in a manner that fits your needs and theirs. Amazon may not be in the business of providing purpose-inspired solutions, but they have essentially become the gold standard in terms of how to find, buy, ship and track products online and that’s a lesson to which all of us should be paying attention. If you need help with the digital toolkit aspect of your business be sure to give us a call. Just don’t do it between roughly noon and 2pm CDT on Monday…our staff will be outside watching the eclipse and hoping the world doesn’t end. David is one of the original members of the software development team behind DistributorCentral’s industry-leading technology platform. Today he serves as a member of the firm’s executive team, providing leadership and strategic support to its software development, sales, marketing and customer support teams and serve as key technical contact for many of the firm’s enterprise-level customers. Innovation and collaboration are two of our basic tenets at DistributorCentral, and the ones that allow us to help our clients focus on their key strengths in order to drive revenue growth.